The Šešupė ( pronunciation (help·info); Russian: Шешупе; German: Scheschup(p)e; Polish: Szeszupa) is a 298 km long river that flows through Poland (27 km), Lithuania (158 km), and Russia (62 km). 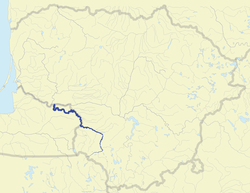 The river flows for 51 km along the border between the Kaliningrad Oblast, an exclave of Russia, and Lithuania. The Šešupė originates near the Polish town of Szeszupka, about 10 miles from the Polish-Lithuanian border, and flows into the Nemunas near the town of Neman on the border between Lithuania and Kaliningrad Oblast. Major towns and cities along the river, from the Nemunas to the source, are: Kudirkos Naumiestis, Pilviškiai, Marijampolė and Kalvarija. There are parts of Kaliningrad and Lithuania that are on the opposite side of the river, including a small island that is mostly Russian but has an area belonging to Lithuania. It is the fourth-longest river in Lithuania. This Podlaskie Voivodeship location article is a stub. You can help Wikipedia by expanding it.